The political history of the Middle East is a complex story wrought with instability, conflict, religious and ethnic cleavages, and artificial imperial and colonial borders. These challenges manifest themselves in varied political systems, norms, and tensions--both domestic and external--in the countries throughout the region. Looking at Lebanon, we see a country that has been, for centuries, a central meeting place of all these conflicts and challenges. From its time under Ottoman rule, Lebanon was beset by religious conflict and infighting among rival religious sects. These violent flare-ups were exacerbated by European intervention in Lebanese affairs. Under French colonization, Lebanon’s confessional system (allocating parliamentary seats based on religious affiliation) was institutionalized, and has been in place ever since. Many argue that this system is the only way to guarantee representation of all the country’s minority groups, while others argue that the system is wrought with corruption and perpetuates reinforcing cleavages, which came to a head during the 1975-1990 Lebanese Civil War. This paper traces the historical background of Lebanon, providing context for the country’s many conflicts and explaining why key political decisions were made. Secondly, it analyzes Lebanon’s political system, focusing on the uniqueness of their confessional system of seat allocation. This section weighs the system’s strengths and weaknesses, as well as its potential to be manipulated. Finally, using corruption data and information from the large black market economy surrounding vote-buying, a case is constructed for the adoption of a proportional system of representation, replacing the dysfunctional methods used in Lebanon today. When looking at Lebanon, the student of history must realize that it has been and continues to be a country struggling to find its identity. As far back as the First Crusade, Lebanon found itself at the mercy of foreign powers imposing their political will on domestic issues. Lebanon was in the main path of the First Crusade's advance on Jerusalem. Later, Frankish nobles occupied present-day Lebanon as part of the southeastern Crusader States.1 The southern half of present-day Lebanon formed the northern march of the Kingdom of Jerusalem; the northern half was the heartland of the County of Tripoli.2 Although Saladin eliminated Christian control of the Holy Land around 1190, the Crusader states in Lebanon and Syria were better defended, and Muslim control of Lebanon was not reestablished until the late 13th century under the Mamluk sultans of Egypt.3 During this time, local Maronite Christian groups were strengthened and supported by the Europeans. They were given more of a political voice in the Crusader States and found wealth trading with Venetian merchants.4 Once given this taste of freedom under a Christian majority, the Maronites would be satisfied with little less once Lebanon returned to Arab rule. One of the most destabilizing events in Lebanon’s history was the League of Nations mandate that placed Lebanon under French governance. Following the collapse of the Ottoman Empire after World War I, the League of Nations mandated the five provinces that make up present-day Lebanon to the direct control of France in 1922.16 According to the agreements reached at San Remo, having taken Damascus in 1920, France’s control over Syria was recognized, providing the French with a unique opportunity. Wanting to maximize the area under its direct control, contain Syrian influence centered in Damascus, and insure a defensible border, France established the Lebanon-Syrian border on the far side of the Beqaa Valley, territory which had belonged to the province of Damascus for hundreds of years, and was far more attached to Damascus than Beirut by culture and influence.17 This doubled the territory under the control of Beirut, at the expense of what would become the state of Syria, and profoundly altered the demographics of Lebanon. Lebanon’s sovereignty issues do not end there. From the beginning of the civil war, Hezbollah has been a rogue actor, subverting government policy and engaging in hostilities with Israel. Funded and supported predominantly by Iran,49 Hezbollah seeks to lay down the bases of a Muslim state, which plays a central role in the world.50 Hezbollah has been kept out of politics by the relatively pro-Western forces of the Lebanese government, but that has not stopped their paramilitary wing from undermining the government’s monopoly over the use of force. Rocket attacks into Israeli territory sparked the 34-day 2006 Lebanon War despite the government’s attempts to avoid conflict.51 In recent elections, Hezbollah’s political wing has actually gained a considerable voice in the parliament. Lebanon’s is a long and complex story wrought with conflict and competing groups. As such it should come as little surprise that this bloody history birthed a political system that strives to maintain peace and equilibrium among those in conflict. The effectiveness of this system is analyzed in next section. The alternating periods of conflict and prosperity found throughout Lebanon’s history may corroborate the classic Clemenza Theorem, which states “This thing's gotta happen every five years or so; ten years; helps to get rid of the bad blood,”52 but they are not conducive to a well-run political system. In this section, I define and analyze the structures of the Lebanese political system; examine how the system affects measures like proportionality and coalition composition; and weight the system’s benefits and drawbacks, such as corruption, vote-buying, and lack of accountability. Before the Taif Agreement, this system was built to maintain a 6:5 majority for Christians (see appendix B for the totals before and after the Taif Agreement). The National Assembly elects the president for unlimited, nonconsecutive six-year terms, and, as agreed in the National Pact of 1943, he or she is to be a Maronite Christian. Post-Independence, the President held veto power, extensive control over the prime minister, and with the 6:5 Christian majority, he was, for all intents and purposes, the head of the government.54 Only after the Taif agreement, were the president’s powers curtailed and limits more explicitly defined. As dictated by the constitution, the president is the head of state, chair of the Supreme Defense Council, and commander in chief of the armed forces.55 The president still holds veto power and a few extended authorities in states of emergency, but the role of the Prime Minister as head of government has been more clearly established. With a better understanding of the complex nature of the power-sharing executives and the split judiciary, one can see how alarmingly easy it can be for political disagreements in Lebanon to snowball into destabilizing conflicts. True political power in Lebanon lies in the 128-seat unicameral legislature. These deputies, directly elected every four years, represent the political preferences and religious diversity of their districts. While as an ideal, this system sounds perfect given Lebanon’s unique circumstances and demographics; the realities of recent elections pain a different picture, and we are left to wonder whether a confessional system can every truly represent the people of Lebanon. The 2009 election can be summed up as an electoral between the March 14th Alliance, led by Saad Hariri’s Future Movement Party, and the March 8th Alliance, led by Hezbollah and Armal. Unfortunately, in spite of tireless searching, party-specific vote data could not be found either through the Interior Ministry’s archives or from open source data online. This may be due to government inefficiency, lack of transparency, and Lebanon’s lack of uniform ballots, which I will discuss in a later section. However, seat allocations and coalition percentages were more readily available. Looking at the results, one is immediately struck by the fact that the March 14th Alliance received only an average of 44.5% of the national vote, but received 71 seats; while the March 8th Alliance received 55.5%, but only 57 seats in the legislature.5960 Coincidentally, this result is virtually the same as the result from the election in 2005.61 What is significant about these elections becomes evident after completing the Least Squares calculation of proportionality. (Sere Appendix D) What we are left with is a roughly 11% deviation from proportionality; nearly twice our global baseline of 6.65%.62 Under normal circumstances, the 11% figure would not raise any red flags, but when we consider it in the context of Lebanon, a country with a political system that is falling over itself to ensure proportional representation of different groups, this figure becomes more interesting. Why, despite their best efforts, are the Lebanese still so far from the proportionality they strive to achieve? The answer lies within the confessional system itself. To illustrate this point, take the district of Baabda as an example. 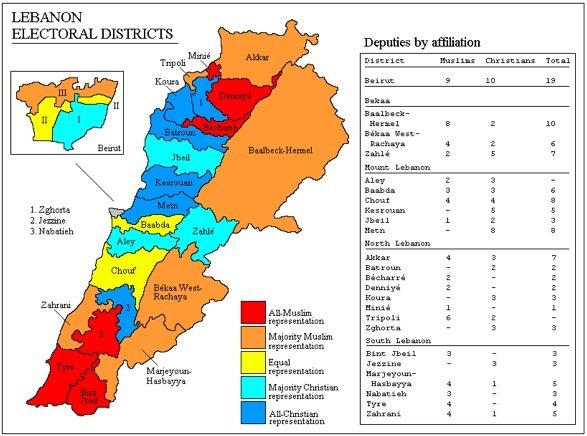 The six seats in this district are split with three seats reserved for Maronites, two for Shias, and the last seat for Druze candidates.63 In this system, the top three Maronite candidates will be elected to the legislature, but the candidate with the fourth-highest vote total receives nothing, even if he/she received more votes than the top Shia or Druze candidates. These votes that are lost and sent into the electoral void decrease the proportionality of the election results and directly undermine voter preferences. With 26 districts electing 128 representatives, Lebanon’s average district magnitude is 4.92 (M = 128/26), which is well below Lijphart’s magical M=7 threshold where a legislature truly represents a microcosm of society.64 With the confessional system, a Maronite voter in Baabda sees the district magnitude cut effectively in half from its intended six seats down to only three. While voters are encouraged and expected to vote for candidates for each seat, regardless of their personal religious identity, this rarely works as originally intended. Religious prejudice may result in voters ignoring candidates of other faiths; party deals and strategies may call for members to vote for certain coalition partners running for other seats, or conversely they may instruct members to ignore a seat entirely.65 This is made possible by the fact that there are no official ballots in parliamentary elections. Voters may either write the names of the candidates they wish to vote for on a plain piece of paper, or they may use party-issued ballots that are almost completely unregulated by the central government.66 These shortcomings of the confessional policies reduce the proportionality and effectiveness of a delicate system and make it susceptible to corruption and manipulation by parties and power players. Volatility: Tempest in a Teapot, or Quiet Serpent Waiting to Strike? Given the challenging demographic realities and fractured political system in Lebanon, coalitions and political alliances have been the only way for parties to remain in power. As such, with these ever shifting alliances and marriages of political convenience, Lebanon is prone to a high level of volatility from cycle to cycle. (See Appendix E for volatility measurements). These powerful alliance structures coupled with the lack of reliable party-specific data make it very difficult to calculate the effective of number parties. While an empirical measure of the strength of Lebanon’s parties would be ideal, qualitative analysis of the volatility table provides some clear insights into coalition structures and the power of individual parties. Looking at the 2011 shift in power, we see the March 14th Alliance lost its majority when Hezbollah convinced the Progressive Socialist Party to leave the Alliance and join the March 8th Alliance government as “pro-government independents.”70 The transfer of those eleven seats reduced the March 14th Alliance from 71 votes to only 60 and allowed the March 8th Alliance to take over with 68 in total. From this point of view, the Progressive Socialist Party was a major power player; while the March 14th Alliance was not a minimal winning coalition, this defection was still enough to cost them the majority. This brings up a deeper question about Lebanese coalitions, namely, how would one form a minimally connected winning coalition? To this there is no easy answer. Given the religious divisions maintained by the confessional system, parties are forced to play political games on two different levels when forming coalitions. A party like the Progressive Socialists does not have a stated religious agenda, as it is more concerned with economic and welfare policies, so on that metric, the socialists would be neutral. A party like Hezbollah, with its clear ideological and theological stance, falls on the Islamist side of the spectrum, but their social policies have room for experimentation. In this case, a party that would sit socially on the left is in high demand by both coalitions due to its central, swing-vote status on the religious metric. Given the right incentives, the socialists could be persuaded to change their allegiances in exchange for a governmental post that would allow them to pursue their policy goals, so long as the main party’s religious agenda does not interfere. There is currently talk in Lebanon of adopting a proportional representation system to replace the current “winner-take-all” confessionism for the 2013 elections. Many in the government are fighting the reform, claiming that Lebanon is not ready for such a change, and that the system is too delicate; but with a recent survey showing that 59 percent of Lebanese favor proportional representation over the current winner-takes-all system,87 and another showing 81.7% of Lebanese prefer that there be a separation between religious activities and economic and social life,88 the writing appears to be on the wall. A proportional system would allow for the creation of catch-all parties to enter and compete in the political system. These national parties, free from the limiting stigmas of confessionism, would create cross-cutting cleavages, providing more opportunities for members of various religious faiths to find common ground and express themselves politically; unlike many of the current religious parties. To assuage the fears of minority groups, a low quota would allow smaller parties of any type to win more seats in the legislature. The beauty here, lies in the fact that these smaller groups could then band together to form new coalitions or larger parties without worrying about appealing to the Maronite and Druze voter in the same district. Finally, giving more power to the judiciary would certainly help clean up electoral politics. As it stands now, the foxes guard the henhouse, as the Constitutional Council can only investigate electoral fraud, but since parties’ manipulative practices are not explicitly illegal, the council is powerless to stop them.92 If however the council were more empowered, precedents could be set that would allow Lebanon to develop into a freer, more democratic society. Solving the political problems faced by Lebanon is no easy task. With deep, internal conflicts that date far back and are still tied to a political system imposed by a colonial power, Lebanon’s democracy is delicate to say the least. Besieged constantly by foreign influences and powers, (France, Syria, Israel, Iran, and Saudi Arabia, just to name a few) Lebanon’s sovereignty has never been fully stable, preventing the country from developing and adopting a political system based around its preferences, not the preferences of others. As the 2013 election draw near, we can only hope that the people will mobilize and elect a government that will work for the best interests of the country. Based on surveys explored in this paper, it seems there is the political will for change, and given the inspiration of this year’s Arab Spring, the people of Lebanon may very well succeed. As Syria retreats inward to deal with its own upheaval and the rest of the Arab World is preoccupied with the unprecedented political change that swept through the region, 2013 may be Lebanon’s first step toward regaining the stability and grandeur that today seems like a distant memory. Blanford, Nicholas. Killing Mr Lebanon: the Assassination of Rafik Hariri and Its Impact on the Middle East. London: I.B. Tauris, 2006. Print. Carnegie Endowment for International Peace. Arab Political Systems: Baseline Information and Reforms – Lebanon. Carnegie Endowment for International Peace. Retrieved 4 July 2009. Corstange, Daniel. "Dominant Parties, Dueling Machines, and Vote Trafficking: Theory and Evidence from Lebanon." Center for Contemporary Arab Studies Lecture Series. Georgetown University. Washington, DC. November 11, 2011. The Godfather. Dir. Francis Ford Coppola. Perf. Marlon Brando, Al Pacino, James Caan, Richard Castellano, Robert Duvall, Sterling Hayden, John Marley, Richard Conte, and Diane Keaton. Paramount Pictures, 1972. Hitti, Philip Khuri. A Short History of Lebanon. London: Macmillan, 1965. Print. Khraiche, Dana. "59 Percent of Lebanese Favor System of Proportional Representation”THE DAILY STAR :: Breaking News, Lebanon News, Middle East News & World News. 20 Oct. 2011. Web. Retrieved from: http://www.dailystar.com.lb/News/Politics/2011/Oct-20/151794-59-percent-of-lebanese-favor-system-of-proportional-representation.ashx. Krayem, Hassan. "AUB: The Lebanese Civil War and the Taif Agreement." Digital Documentation Center - AUB. Web. 17 Nov. 2011. Retrieved from: http://ddc.aub.edu.lb/projects/pspa/conflict-resolution.html. Lapidus, Ira M. A History of Islamic Societies. Cambridge [u.a. : Cambridge Univ.,] 2007. 147. Print. Longrigg, Stephen H. Syria and Lebanon Under French Mandate. London: Oxford University Press, 1968. Salem. 1992b. "Watheeqat al-Wifaq al-Watani Bayn Bayrut wa Dimashk wa alTa'if' [National Reconciliation Document Between Beirut, Damascus, and al-Taif ] al-Safir Wednesday August 12, p. 13. Salibi, Kamal S. "The Imagined Principality." A House of Many Mansions the History of Lebanon Reconsidered. Berkeley, CA: University of California, 1988. 108-130. Print. Salibi, Kamal S. "Ottoman Lebanon: How Unique." A House of Many Mansions the History of Lebanon Reconsidered. Berkeley, CA: University of California, 1988. 151-166. Print. UN Office for the Coordination of Humanitarian Affairs (2006-03-29). "LEBANON:The many hands and faces of Hezbollah". Worth, Robert F. "Foreign Money Seeks to Buy Lebanese Votes - NYTimes.com." The New York Times - Breaking News, World News & Multimedia. 22 Apr. 2009. Web. Nov. 2011. Retrieved from: http://www.nytimes.com/2009/04/23/world/middleeast/23lebanon.html?_r=1. 1.) Salibi, Kamal S. "The Imagined Principality." A House of Many Mansions the History of Lebanon Reconsidered. Berkeley, CA: University of California, 1988. 108-130. Print. 5.) Lapidus, Ira M. A History of Islamic Societies. Cambridge [u.a. : Cambridge Univ.,] 2007. 147. Print. 7.) Salibi, Kamal S. "Ottoman Lebanon: How Unique." A House of Many Mansions the History of Lebanon Reconsidered. Berkeley, CA: University of California, 1988. 151-166. Print. 9.) Hitti, Philip Khuri. A Short History of Lebanon. London: Macmillan, 1965. Print. 15.) Salibi, Kamal S. "Ottoman Lebanon: How Unique." A House of Many Mansions the History of Lebanon Reconsidered. Berkeley, CA: University of California, 1988. 151-166. Print. 16.) Longrigg, Stephen H. Syria and Lebanon Under French Mandate. London: Oxford University Press, 1968. 20.) Longrigg, Stephen H. Syria and Lebanon Under French Mandate. London: Oxford University Press, 1968. 21.) Krayem, Hassan. "AUB: The Lebanese Civil War and the Taif Agreement." Digital Documentation Center - AUB. Web. 17 Nov. 2011. Retrieved from: http://ddc.aub.edu.lb/projects/pspa/conflict-resolution.html. 23.) Hitti, Philip Khuri. A Short History of Lebanon. London: Macmillan, 1965. Print. 27.) Salem. 1992b. "Watheeqat al-Wifaq al-Watani Bayn Bayrut wa Dimashk wa alTa'if' [National Reconciliation Document Between Beirut, Damascus, and al-Taif ] al-Safir Wednesday August 12, p. 13. 28.) Younis, 1. 1985. Silsilat al-Watha'iq al-Siyasiyya Lil-azma al-Lubnaniyya [Basic Documents of the Lebanese Crisis]. Vol 5. Beirut. 29.) Krayem, Hassan. "AUB: The Lebanese Civil War and the Taif Agreement." Digital Documentation Center - AUB. Web. 17 Nov. 2011. Retrieved from: http://ddc.aub.edu.lb/projects/pspa/conflict-resolution.html. 41.) Blanford, Nicholas. Killing Mr Lebanon: the Assassination of Rafik Hariri and Its Impact on the Middle East. London: I.B. Tauris, 2006. Print. 48.) Blanford, Nicholas. Killing Mr Lebanon: the Assassination of Rafik Hariri and Its Impact on the Middle East. London: I.B. Tauris, 2006. Print. 49.) UN Office for the Coordination of Humanitarian Affairs (2006-03-29). "LEBANON:The many hands and faces of Hezbollah". Retrieved 2006-08-17. 52.) The Godfather. Dir. Francis Ford Coppola. Perf. Marlon Brando, Al Pacino, James Caan, Richard Castellano, Robert Duvall, Sterling Hayden, John Marley, Richard Conte, and Diane Keaton. Paramount Pictures, 1972. 54.) Krayem, Hassan. "AUB: The Lebanese Civil War and the Taif Agreement." Digital Documentation Center - AUB. Web. 17 Nov. 2011. Retrieved from: http://ddc.aub.edu.lb/projects/pspa/conflict-resolution.html. 56.) Carnegie Endowment for International Peace. Arab Political Systems: Baseline Information and Reforms – Lebanon. Carnegie Endowment for International Peace. Retrieved 4 July 2009. 62.) Langenbacher, Eric. CPS Lecture. Georgetown University. Washington, DC. November 9, 2011. 64.) Lijphart, Arend. Patterns of Democracy: Government Forms and Performance in Thirty-Six Countries. New Haven: Yale Univ., 1999. Print. 66.) Corstange, Daniel. "Dominant Parties, Dueling Machines, and Vote Trafficking: Theory and Evidence from Lebanon." Center for Contemporary Arab Studies Lecture Series. Georgetown University. Washington, DC. November 11, 2011. 67.) Langenbacher, Eric. CPS Lecture. Georgetown University. Washington, DC. November 9, 2011. 68.) Krayem, Hassan. "AUB: The Lebanese Civil War and the Taif Agreement." Digital Documentation Center - AUB. Web. 17 Nov. 2011. Retrieved from: http://ddc.aub.edu.lb/projects/pspa/conflict-resolution.html. 71.) Corstange, Daniel. "Dominant Parties, Dueling Machines, and Vote Trafficking: Theory and Evidence from Lebanon." Center for Contemporary Arab Studies Lecture Series. Georgetown University. Washington, DC. November 11, 2011. 76.) Blanford, Nicholas. Killing Mr Lebanon: the Assassination of Rafik Hariri and Its Impact on the Middle East. London: I.B. Tauris, 2006. Print. 80.) Corstange, Daniel. "Dominant Parties, Dueling Machines, and Vote Trafficking: Theory and Evidence from Lebanon." Center for Contemporary Arab Studies Lecture Series. Georgetown University. Washington, DC. November 11, 2011. 82.) Worth, Robert F. "Foreign Money Seeks to Buy Lebanese Votes - NYTimes.com." The New York Times - Breaking News, World News & Multimedia. 22 Apr. 2009. Web. Nov. 2011. Retrieved from: http://www.nytimes.com/2009/04/23/world/middleeast/23lebanon.html?_r=1. 83.) Corstange, Daniel. "Dominant Parties, Dueling Machines, and Vote Trafficking: Theory and Evidence from Lebanon." Center for Contemporary Arab Studies Lecture Series. Georgetown University. Washington, DC. November 11, 2011. 84.) Krayem, Hassan. "AUB: The Lebanese Civil War and the Taif Agreement." Digital Documentation Center - AUB. Web. 17 Nov. 2011. Retrieved from: http://ddc.aub.edu.lb/projects/pspa/conflict-resolution.html. 87.) Khraiche, Dana. "59 Percent of Lebanese Favor System of Proportional Representation”THE DAILY STAR :: Breaking News, Lebanon News, Middle East News & World News. 20 Oct. 2011. Web. Retrieved from: http://www.dailystar.com.lb/News/Politics/2011/Oct-20/151794-59-percent-of-lebanese-favor-system-of-proportional-representation.ashx. 89.) Corstange, Daniel. "Dominant Parties, Dueling Machines, and Vote Trafficking: Theory and Evidence from Lebanon." Center for Contemporary Arab Studies Lecture Series. Georgetown University. Washington, DC. November 11, 2011. 92.) Carnegie Endowment for International Peace. Arab Political Systems: Baseline Information and Reforms – Lebanon. Carnegie Endowment for International Peace. Retrieved 4 July 2009. Source: Krayem, Hassan. "AUB: The Lebanese Civil War and the Taif Agreement." Digital Documentation Center - AUB. Web. 17 Nov. 2011. .